The imaginative possibilities are endless with the Colossal Fort Kit, featuring a full 160 cubic square feet of creative space. Inspire creativity and encourage imaginative growth with these versatile Christmas gifts for kids this holiday season. 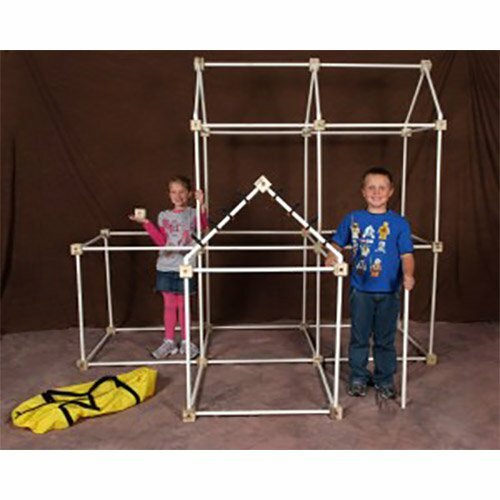 The Colossal Fort Kit features 160 magnificent cubic square feet of space! Get the kids away from the video games and TV and let them create their next big adventure. Whether the kids want to imagine they are in a royal castle ready to defend their empire, aboard a massive submarine exploring beneath the sea, or soaring through the sky in a huge jet, the possibilities are simply endless! Built to last, Toydle fort kits are designed to withstand creative play for many years to come. The kids will love taking this fort kit out to the lake or beach, to Grandma’s house, and wherever else they may roam, and the convenient carry bag helps ensure that everything stays together.Great Christmas Gifts for Kids.